The signs and marking staff is responsible for all street markings, sign construction and maintenance on all city-owned streets, minor lane markings, and painting curbs, stop bars, and handicap spaces. This crew is also responsible for placement of signs and barricades for city projects, and assisting the engineering division with traffic counts. Signs are placed in accordance with the Manual on Uniform Traffic Control (MUTCD) and must be placed in the safest, most appropriate location. 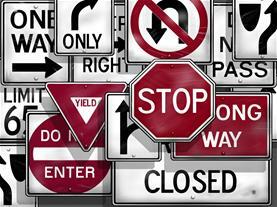 The signs that are created by the City sign shop can only be used on public right-of-way. Can I get a "Children at Play" sign installed in my neighborhood?